Less typing using the built-in canned messages to speed up creating invoices and reports. Use your own SQL Server Database on-premises so you can create your own customer reports, export your own data whenever you want! Lots of reports built-in from customer address maps, financial reports, who are your best customers and more! - Track tickets, assets and serial numbers from single interface. - Quickly access new and old tickets. Colour coded to identify older tickets. - Filter search by keywords, Customer names, job information. CRS sends out automatic status updates by email and SMS ensuring your customers are always kept informed. - From the main screen you can see how many jobs you have booked in, awaiting payment, appointments and stats. - Quickly print labels for any ticket without opening the ticket. - Quick access to Point Of Sale and all CRS modules. Amazingly simply to use built-in template editor to fully customise the look of your customer emails and printed receipts, invoices etc. • Your data is YOUR data! Your private customer data is located on your own computer giving you full control over how you use your own data! • Database hosted on your own network - still works even when your internet is not! 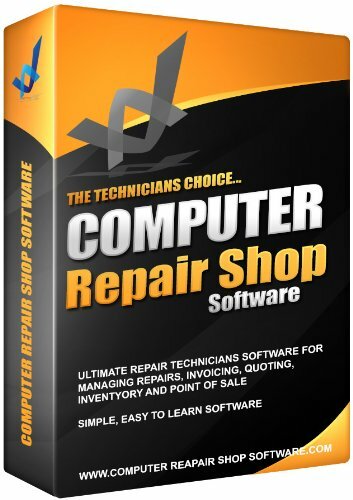 • CRS FREE Edition for start-ups and new computer shop owners who want to start using professional and time efficient PC repair tracking and ticketing software from the beginning! Using CRS will ensure you are optimising your time, stay organised and be successful. • Affordable monthly Subscriptions designed for established shops and business owners using CRS as the backbone of their business! • CRS is specific to computer repair shops and technicians no matter if you have a computer repair business and repair shops or work from home on your own. • Job Tracking, Point Of Sale, Inventory, Part Ordering and Tracking, Quoting and Invoicing System All-In-One easy to use package. • DESIGNED BY COMPUTER SHOP CHAIN OWNER! We know what you want as we own and run our own chain of shops where CRS is the backbone of our successful business! • Minimise errors and mistakes, Speed up your repair check-in process. CRS is designed for simplicity and speed - this is just what all successful businesses require! • Full ticket tracking from the day the computer is checked in to the day it leaves your workshop! • World Wide User base. CRS works in all countries. • New features driven by you! Want a new feature, just ask! • Built In CRM system ensure you capture important customer data. Perfect for re-marketing - something all successfull business owners NEED TO DO every day! • Easy to Export Customer emails and names into your own spreadsheets, mailchimp, Facebook advert manager etc. • Email, SMS and call your customers using skype or VOIP directly from CRS. All communications are logged to later retrieval. • Import your existing customers from systems such as CommitCRM, excel, repairshopr, quickbooks and more. • Easy to Use, Integrated POS terminal with direct access to the CRS ticketing database. • Full integration of barcode scanners, thermal printers, cash tills etc for a professional POS system. • Track every repair, from the moment it is checked into CRS to the moment it leaves your shop. • Customers receive automatic updates by email / sms on their repair process. • Check In Receipts, Invoices, Service reports, Quotes are all based on fully customisable templates using simple html templates provided. Embed ##TAGS## into the reports to display data from the ticket automatically. CRS is virtually ready to work right away with little setup required. • Easy part tracking for customer repairs. • Know when parts need to be ordered, on order and returned to suppliers. Full tracking. • See list of all parts that need to be ordered for repairs - fast and easy. When parts arrive, allocate the part to the customer repair in seconds! Asks all the relevant questions - no mistakes and missing information - EVER AGAIN! • When a repair is being booked in it is easy to forget to ask your customer about data backup or the user's password. This won't happen with CRS! You are prompted to ask for specific information like this (and more). • Never forget to log additional items such as Laptop Power Adapters or Installation CDs etc, this is all tracked and each item gets it own dedicated label to automatically link it to the job - your customer leaves happy that you know what you are doing and their items will never get lost! • Time is Money.... so less time typing means more time to make money! • Software Tests - Within seconds, you can create a comprehensive report of EVERTHING you have done to service your customer's computer. They will love the fact you gave them a personalised report of all your work over several pages - They will think you spent hours typing it up! When in fact it took a few seconds! • Save time typing the same information over and over with our canned responses facility. Throughout CRS, in areas that would normally require lots of typing (such as work report, invoice notes, service notes, hardware and software tests etc) you can use Canned Messages that are designed to quickly add your information into the ticket in a click of a button. Your customers will think you spent hours writing their report when it was just a few clicks! • Track your customers hardware configurations, Operating System type and license keys, serial numbers, warranty information (purchase date, purchased from, sale date etc). This is perfect for keeping detailed machine specification or ideal if you sell computers for warranty tracking. • Generate, email and print invoices and quotes directly from the repair ticket. • CRS manages your stock from an easy to use interface. • Your inventory can be used in repair tickets for invoicing parts, labour and services and will be used in the Point Of Sale application. • Allocate stock from shop floor, store rooms and any other locations you set up. Advanced stock management. • Do you track customer license keys? 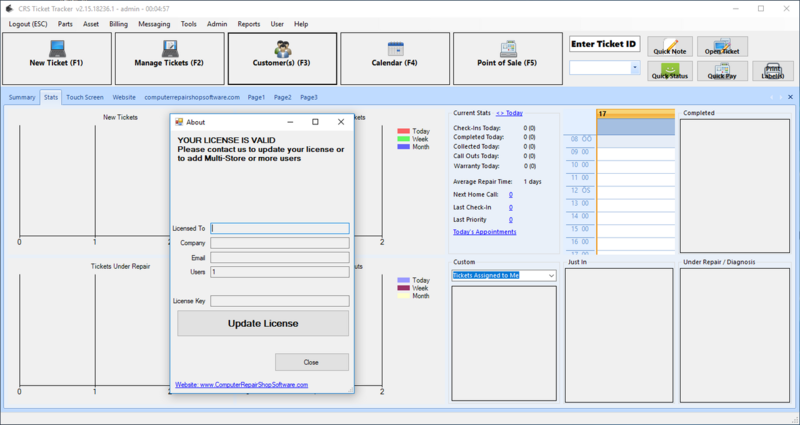 License Key Manager will allow you to allocate keys (such as AV software, Office etc) to customers, remind customers when they are due for renewal. if you keep license keys in bulk, then this can be added to inventory and tracked. • Track your Appointments and Events. Appointments can be added/edited directly from the repair ticket. • Google Calendar sync of appintments. • Appointment types can be Call Outs, In-Store appontments, Telephone Calls etc. • Syncs to yours (and your technicians) smartphone and gmail calendar s if they are out on the road, they get instant updates. • Keep up to date with your appointments while on the road. • CRS calendar sync with google Calendar. • Create, Edit, Delete appointments directly from CRS and this is sent to your technicians smartphone showing them the customer's address, phone number and ticket information etc. • No paperwork required which is perfect if the appointment is made for you while you are out on the the road. • Add documents, images, insurance reports etc to any ticket. Gets saved directly to the database which means attachments can be viewed from any computer. • Attachments can also be attached to Customers so this information can be opened from any ticket for that customer. • Send Messages Internally between staff. When they log in, a notification will display indication unread messages. • Admin users can SEND TO ALL users. • Perfect for meeting reminders, customer questions and job related questions. • If an email address is included, you can optionally send to technicians email address directly from CRS. Built-in Customer Communications - All communications are saved to the ticket history so you know what was said, by whom and when. Communicate directly to your customer via SMS or Email. • Email - Email your customers directly from CRS. Email template displays your company details, opening hours, phone number etc with your own message. Email status updates, messages, invoices, quotes and service report directly to your customers. • SMS - SMS is fully integrated and allows you to keep your customer informed of the repair process. • Homepage graphs shows New Tickets, Completed Tickets, Call outs etc. Switch displays for Today, yesterday, this week, last week, this month and last month. • Today, Yesterday, This Week, Last Week, This Month, Last Month, This Year, Last Year stats and reports and custom start and end dates. • Daily stats by email / SMS (coming soon) directly to you (ideal if you employ staff and you are not around so you can keep up to date with what's been checked-in or completed). • Advanced Reports - customers reports (such as who are your best paying customers - make sure you re-market to your best customers! ), tickets reports, financial reports, and more. • More than one shop? No problem. CRS is multi-shop compatible. • CRS works for as many users you need. • No limits of number of computers you install CRS onto. • Software works on any Windows Vista, Windows 7, Windows 8 and Windows 10 computer. • CRS uses Microsoft SQL Server Standard or Express Edition for easy deployment of additional terminals. Database can be located on your premises or in the cloud. • Cloud databases also available directly from us giving you access to CRS from anywhere in the world. • If you are a livedrive reseller you can set up livedrive accounts directly from the software.